The more I think about how ‘The Cloverfield Paradox’ has set up the Cloverfield universe, the more my head starts to spin. Starring Gugu Mbatha-Raw, Daniel Bruhl, David Oyelowo, John Ortiz, Chris O’Dowd, Ziyi Zhang, Aksel Hennie and Elizabeth Debicki, ‘The Cloverfield Paradox’ is the third entry in the secretive ‘Cloverfield’ series. Set in 2028, a group of astronauts aboard a space station make a terrifying discovery that challenges everything they know about the fabric of reality which results in a desperate fight for survival. To start off I am a huge fan of ‘Cloverfield’ and ’10 Cloverfield Lane’. I loved how different they were in both story and tone and how they have become influences for found footage and isolated thriller movies. So, you could say I was excited to see what was next in this movie universe. When the trailer for ‘The Cloverfield Paradox’ came out hours before its release, I was thrilled. I couldn’t believe that they pulled off one of the best marketing campaigns I’ve ever seen. But after watching the movie, I can see why they did that and didn’t release it in theatres. Okay, before you start attacking me because of my opinion on this movie, there were things I really liked. The performances were amazing across the board with Gugu Mbatha-Raw as the standout. She was amazing as an almost-Ripley type character with a tragic past. She was great to watch and her character was one of the more interesting ones. Daniel Bruhl was also great in the movie. He’s definitely one of the most underrated actors working today and it was good to see him give yet another great performance. David Oyelowo was as great as he always is, as was Elizabeth Debicki who became a rather interesting character as the movie progressed. Chris O’Dowd was pretty much typecast as the comedic relief. Although he is really good in the movie, the comedy that was written for him doesn’t land well most of the time. But this is because of the writing which I will talk about shortly. Basically, all of the performances were great and they contributed a lot to the movie. ‘The Cloverfield Paradox’ is also a gorgeous movie with some of the best special effects I’ve ever seen for a Netflix movie (Although it’s not really a Netflix movie as it was originally going to be released in theatres). Every scene set in space is beautiful and you can tell that the special effects team put a lot of effort into making it look great. The Cinematography was also quite good. Although there are a lot of dutch angles (I lost count 20 minutes in), it’s still a well-shot movie and it’s quite similar to other isolated space movies like ‘Alien’ and ‘Event Horizon’. But now I must move onto the negatives and although there are only a handful of negatives, they do take a lot out of the movie. The main problems I had with the movie were the writing and the connections to the previous two ‘Cloverfield’ movies. The writing could have been a lot better as it does come off as if a couple of first-year film students had written it. Now I know that that statement can be contradictory but it does seem really amateur. The dialogue is a mixture of being too simple and often too complicated. This mixture works well in some movies that I’ve seen before but here it doesn’t go over well. This could also be because of how much I loved the writing in the previous two ‘Cloverfield’ movies, but I was expecting more from the writing department. There are glimpses of masterful writing in the script but it does fall flat in the end. This also leads me to how they connected this to the other two ‘Cloverfield’ movies, especially ‘Cloverfield’. 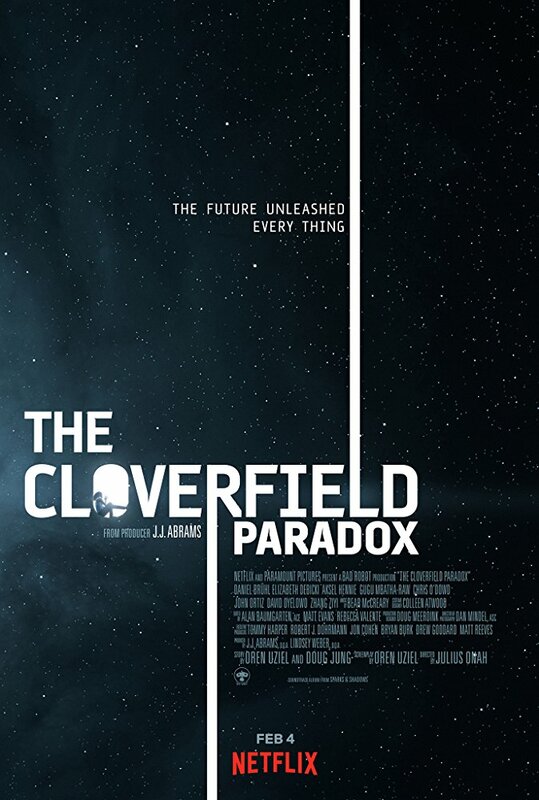 I know that originally the script for this was called ‘God Particle’ and it was pretty much the same story but with no connections to ‘Cloverfield’. Now I don’t want to spoil the connections to the ‘Cloverfield’ movies as it’s better to go in knowing nothing, but what I can say is that most of the connections (especially the last shot) seemed like they were just shoehorned in to say that this is a ‘Cloverfield’ movie. I know that a lot of people out there don’t have any problems with this but it did take a lot out of the movie for me. There is also this sub-plot that takes place on Earth and it doesn’t really go anywhere by the end. The more I think about it the more I hate it and it definitely didn’t need to be in the movie. As of now, ‘The Cloverfield Paradox’ has a score of 16% on Rotten Tomatoes but that is way too harsh. This isn’t a terrible movie but it isn’t great. So don’t go in thinking this the worst movie of the year. I also feel like if this wasn’t a ‘Cloverfield’ movie it would have performed a lot better. Overall, ‘The Cloverfield Paradox’ had brilliant marketing (maybe the best marketing of the 21st century) but it failed to meet the high expectations set by the previous two ‘Cloverfield’ movies. The amazing casting, great performances and gorgeous special effects almost succeeded in making the movie better, but the writing and ‘Cloverfield’ connections brought it down in the end. It’s not terrible but it definitely could have been a lot better. Saying that though I am still looking forward to seeing where this series is heading.